Sublimated Patches » Embroidery Talk Has Moved! Many of you probably already know that EnMart sells blank patches, but you may not be aware of our sublimated patches. Today I wanted to tell you a bit about those patches and why we sell them. The sublimated patches we offer are made, like our blank patches, by our parent company Ensign Emblem. These patches are designed to withstand the rigors of an industrial laundry, so they’re sure to hold up under whatever wash cycle your customers put them through. These patches are so durable there is a chance they’ll last longer than the garment will. 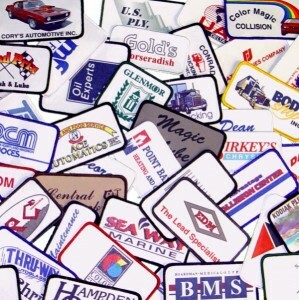 If you have corporate clients who are looking for a colorful and durable way to advertise their businesses, sublimated patches are the perfect solution. EnMart’s sublimated patches are known as PrintMate Emblems, and are an economical and colorful solution for garment identification. Our sublimation process is an efficient method of creating full color patches digitally and permanently dyed with any text, artwork, photograph, or design you choose. The patches are “photo-realistic” which means we can accurately reproduce photo quality artwork and can create patches with extraordinary detail. If you have an intricate design you wish to put on a patch, PrintMate emblem will suit your needs perfectly. EnMart’s PrintMate emblems are created to the exacting standards set for all EnMart’s products. The fabric of the patches is 100% polyester, the merrow thread used is Iris Merrow Thread, which has been tested to industrial wash standards, and is extremely colorfast and durable. Our sublimation ink is made by Sawgrass and creates sharp, true colors. If you’re looking for an economical way to offer your customers full color, photo realistic patches, PrintMate emblems are you best choice. To learn more about this products, call us at 866-516-1300 or visit our website. This entry was posted on Monday, October 26th, 2009 at 10:33 am and is filed under Patches/Emblems. You can follow any responses to this entry through the RSS 2.0 feed. Both comments and pings are currently closed.